When most people think of lavender farms, they don’t think of Hawaii. But this farm’s fragrant seaside breezes and sweeping ocean vistas might make you forget all about France and merge the colorful purple blooms forever in your mind with memories of Maui. The (relatively) tiny Alii Kula Lavender Farm welcomes visitors for daily tours of its 13.5-acre cliff-side plot sporting 45 different varieties of the calming herb. It’s location in Kula, 4,000 feet above sea level in the Island’s elevated central region, enjoys a Mediterranean climate and also grows olive trees, hydrangea, South African protea and succulents. Explore the farm on your own via their lavender treasure hunt or take a guided walking or golf-cart property tour departing several times each day (additional costs apply). In case you needed another way to relax on Maui, the farm house’s large lanai (porch) overlooking its gardens, white gazebo and the sea provides the perfect spot to indulge in lavender tea, a pre-packed gourmet picnic lunch featuring a special lavender-infused dessert or other organic botanical products from the onsite gift shop. 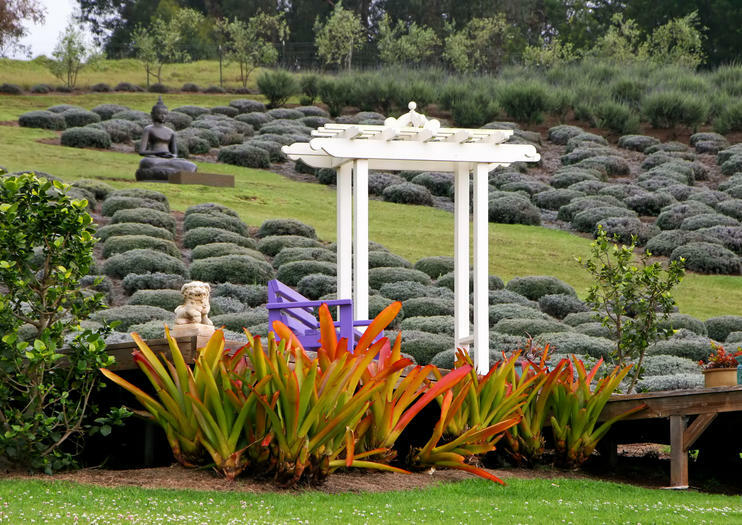 Alii Kula Lavender Farm is open daily from 9 a.m. until 4 p.m. It is located at 1100 Waipoli Road—past the Kula Forest Reserve gates following the signs around the loop road. The last tour departs at 2:30pm. Golf cart tours departing twice daily ($25). General admission is $3 with discounts for Hawaii residents, military, seniors, and groups. Kids 12 and under are free.